More than a bit hazy this March 14 as many of the group teed off in a blinding fog. How the poor caddies were able to find the balls remains their secret. Groups called back to groups following so they would know it was safe to hit. This lasted until Hole 3 for the first four groups. When the fog cleared it turned into a beautiful day for golf. Humidity was low and the course was in good condition except for a couple of greens. 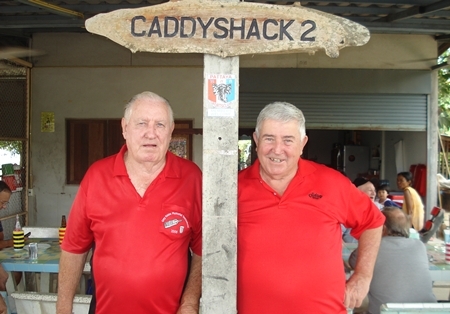 Returning to Caddy Shack II, the cards were tallied and once again Paul Kraft was the winner with a 38, followed by Jerry Hore and Richard Hall, both with 37. Jerry won on the count back. A total of 16 players showed up and basically the scores were lower than normal. Herbie provided snacks only as food was going to be available at the Blue Moose Bar celebrating Bill Thompson’s 55th Birthday. Tuesday winner Paul Kraft (left) with Jerry Hore.